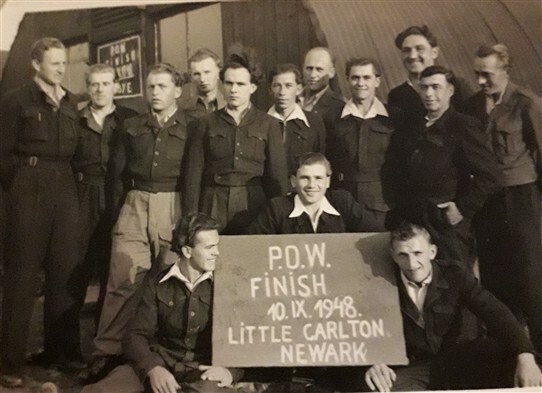 During the Second World War German POWs were held at Little Carlton. In His Book Bathley Boy (p.70), Trevor Frecknall - a native of that village and a child at the time - records that the POW camp took over the Crew Yard and cowsheds at Bathley Lane Farm in Little Carlton. He notes also how "the Grass verge just round the sharp bend from Bathley towards the main road between Newark and Sheffield [was] extended.... for a sentry box". Following VE Day the POW camp continued, but became more relaxed, and Trevor Frecknall (now a toddler) "became a favourite of some of the German soldiers who [were] becoming increasingly desperate to return to their defeated and devastated homeland..." Trevor remembers that a drawing was made of him by one of the prisoners, Kurt Saurerberg' who, although being re-patriated soon after, remained in touch with the Phillips-Moul family in the nearby village of North Muskham"
Following closure of the Little Carlton camp, the wooden huts in which the POWs had been housed were quickly returned to farm use. They may, however, still be seen today. 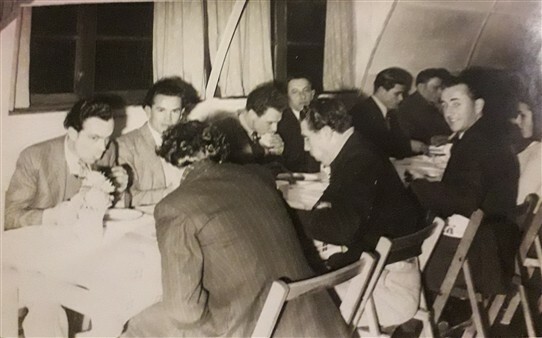 Editor's Note: We are most gratedful to Mr Antony Bruce who has sent in the following two photos connected with the POW camp at Little Carlton. The first picture shows Mr. Bruce's grandfather, Petro Cap, standing behind the sign on the left (with black hair). This page was added by Website Administrator on 19/11/2014. We are facilitating a group of North Muskham villagers called the 'Capturing Memories'project. and would love to hear from other people who have had contact in any way with the camp. We have just received a 'model in a bottle' that was made by one of the POWs and given to a villager.